Posted on June 23, 2013	by chainsoff. Small Wars Journal this month is presenting a long paper examining seven flashpoints around the globe that contain the potential to break into open warfare that draws in the United States. While the paper seems a bit like a first draft and relies on some sketch sources (e.g., Debka), it is an interesting read. If any of these flashpoints do explode, there will be no excuse for US planners to be caught flat footed about the nature of the combatants. One value of the last ten years of warfare is that, should conflict arise again, the US will bring not only the largest military force to the fight, but the most experienced, as well. South China Sea: Involves China, Vietnam, Philippines, Taiwan, Japan, Malaysia and Brunei. The Hojjatieh Society: Involves Iran, Israel and the United States. Sinai Peninsula: Involves Egypt, Israel and Palestine. V.I.R.U.S: Involves Venezuela, Russia and Iran. The conflicts of the last 11 years have provided the U.S. military with new perspectives, advances in weaponry and technology, complex tactics, strategies, and, of course, a new generation of alumni from the warrior class of Americans. As these conflicts in most minds are in the rearview mirror, some believe that there will be a time of rest and peace, while some have the forethought of conflicts to come. Some of these conflicts have already begun. As totalitarian regimes fall, civil movements and non-state actors align themselves to fill the gap. Where militaristic states once ruled with an iron fist, a class of educated political extremists slips into contention via exploitation of the laws of civilized men. Today’s Army must rise from the ashes of the last two wars, not seeking the comforts of a pre-9/11 Garrison, not forsaking the lessons of the last 11 years, but taking from the victories and regrettable losses. All these lessons can be used as mortar for building a stronger, more resilient Army. The U.S. Army, in its post-war posture, must look at the possibility that a United States with a weakened economy, divisiveness in many aspects of public opinion and the perceived complacency of its fighting force, could be perceived as the perfect prey for former super powers, reemerging empires and non-state actors powered by ideology. For the U.S. Army to restructure and prepare for the future it must look at large formal armies that are currently using proxies to engage in small conflicts that enforce a larger agenda. It must look at spheres of influence of global movements in “Backyard America” and their transcontinental associations. This paper will discuss seven conflicts (or potential conflicts) that the U.S. military should include into scenarios of training and planning, before it becomes like Sept 12th, 2001 and the United States is scrambling to build its knowledge on “Radical Islam”. In the Eastern Himalayas, there is a border conflict called the Sino (China)-Indian Border Dispute. It involves an ongoing conflict between China, Bhutan, Nepal and India regarding the fact that Bhutan and India are the only two countries that China has no resolved land borders with. The areas of contention are the “Chicken Neck” (narrow section of India, north of Bangladesh), west of Bhutan into India and northern section Bhutan and an area north of the India’s northeast states called Arunachal Pradesh. 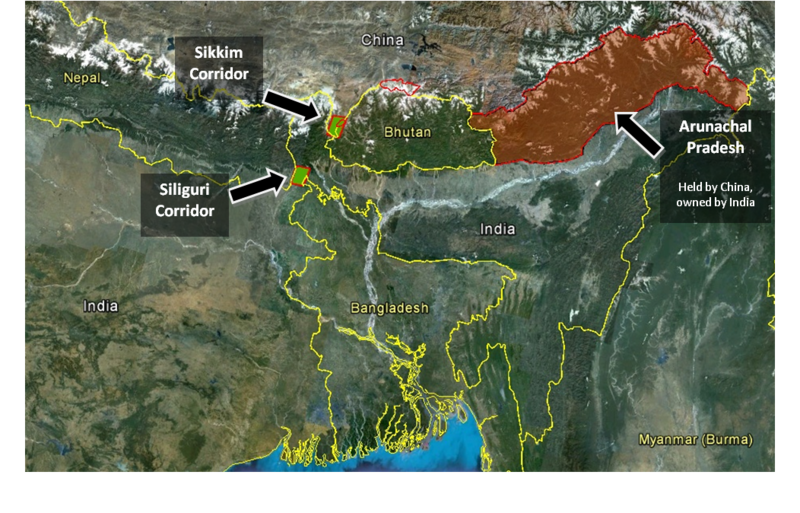 One of China’s goals is to expand through the Chumbai Valley and secure the territory, further indicated by the buildup of the Qinghai Tibet railway towards the Sino-Indian Border, next to Sikkim and Siliguri Corridors. The Chinese Railways Ministry has confirmed that the Railway will be extending its railway network from Lhasa to Zangmu on the Nepal border. Over the years, China has practiced its tactic of gradually expanding its spheres of influence through construction projects (to include mineral excavation and ports of trade). These projects are typically conducted by a government-funded business that attains protective services of the PRC. A relevant example of expansion and intrusion would be the 2007 incident of intrusion by Chinese troops on Bhutanese soil, where unmanned posts were dismantled in the Dolam valley, followed by additional intrusions in 2009. China will have a much more difficult time influencing India through its aggressive actions. China has demanded that the Indian Army remove bunkers located at the tri-junction of India, Bhutan and China and demanded access to the Fingerpoint area at the Northern most point of Sikkim. China has been showing a more aggressive stance while attempting to gain what appears to be the “Five Fingers” of Tibet’s palm: Ladakh, Nepal, Sikkim, Bhutan and Arunachal Pradesh. The dispute will likely be cut short by India’s strong stance, Bhutan not compromising its sovereignty and China’s claim to Bhutan as a greater Tibet. Although China has not started the anticipated railway construction, it has begun its study on whether or not it can complete the Tibet Railway, which currently falls 500 km short of the Siliguri Corridor. This is projected to be complete by 2017. This corridor is known as “India’s Chicken Neck”, which joins India’s Mainland with its seven states in the Northeast. China plans to extend its railway to four strategic points in “Nathu La (Sikkim), Chumbai Valley (China, India-Bhutan), Kodari (Nepal) and Nyangtri (Arunachal Pradesh). Additionally, China has built all weather roads and advanced communication networks along these border areas joining neighboring South Asian Countries. China has increased its geo-political weight in South Asia; it has stirred India at an alarming level. Ultimately, the roads, railway and communication networks that China is creating seem eerily familiar to Russia’s construction of roads and railways, which led up to the Russian-Georgian Conflict in 2008. China with its expanded sphere of influence along these border provinces and countries provides China with a second line of defense and a more obtainable goal of reaching the Bay of Bengal and cutting off India from its Northeastern States. This all is detrimental to India’s overall security. There is much speculation on the future of Afghanistan upon the end of U.S. combat operations. Some predict a reemergence of the Taliban, reasserting the “You have the watches, but we have the time” scenario. Some speculate that Trans-continental Criminal Organizations (TCOs) will continue coordination with corrupt leadership within Afghanistan, but will operate more overtly and at a higher capacity. Others assess that neighboring nations will attempt to exploit valuable natural resources and other avenues of commerce that have lain dormant in this country for decades. It is abundantly clear that China is fronting Pakistan in a much larger strategy in the region, extending to the Gulf and the Middle East on one side, and the Central Asian States on the other. In between, however, there is India to deal with- the Kashmir issue, India’s acceptance among the Afghan people in a historical relationship, similar Indian relations with Central Asian States and their people, as well as no-friction exchanges and trade and economic relations with the Gulf and the Middle East. This is a huge diplomatic, political and economic ensemble. There have been many small conflicts and land grabs between Pakistan, China and India in this area. The main question is: Why? The answer is: It all centers on China. Mineral Excavation (Iron Ore, Copper and rare minerals). Building an Oil pipeline from Herat to Bayiman to Badakshan into China’s Xinjiang Province. Open a land trade route through Pakistan via the Karakoram Highway. One looming issue is held above all: Security. What will be the security situation within Afghanistan after the U.S. ends combat operations in 2014? China has signaled it will not contribute to a multilateral fund to sustain the Afghan National Security Forces…but it could directly train Afghan Soldiers. They’re concerned that there is going to be a security vacuum and they’re concerned about how the neighbors will behave. 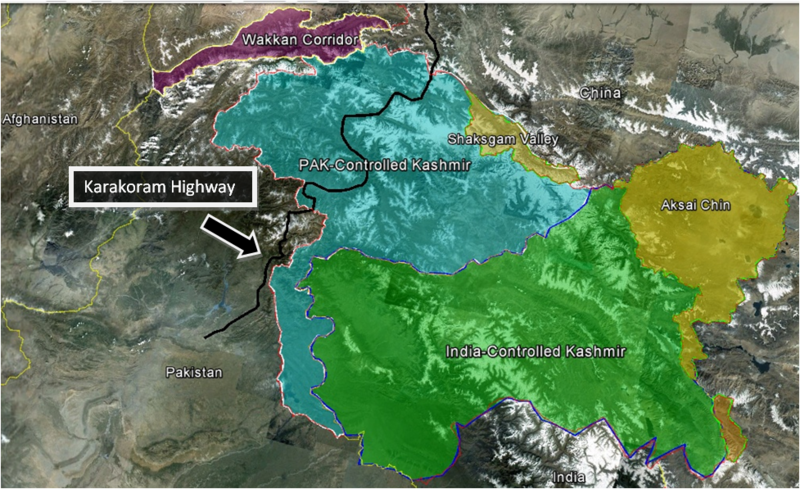 In order for China to see these projects through to fruition, it needs to conduct significant construction in the Pakistan-owned Kashmir, Jammu-Kashmir, Wakkan Corridor and the Karakoram Highway (otherwise known as Gilgit-Baltistan/ Jammu and Kashmir). It is now been revealed that the Chinese workers in Gilgit- Baltistan are no ordinary labourers. They are from the PLA (People’s Liberation Army) Logistics Department, engineers and soldiers involved in construction. Technically, they belong to the PLA and the PLA is on active duty on foreign soil. …The PLA activity in Gilgit-Baltistan lays bare the much touted deceptive proclamation that not a single Chinese soldier will be placed on foreign soil. This entire area is interconnected and the nucleus of a large problem for Southwest Asia. China held a trilateral discussion involving officials from Pakistan and Afghanistan to discuss efforts to seek reconciliation with the Taliban. China’s biggest concern lies with where the Taliban might attack, sabotage and possibly collect zakat (taxes) against China’s efforts in Afghanistan, NWFP (North West Frontier Province) and PAK-controlled Kashmir. If this activity is not resolved prior to the United States withdrawal from Afghanistan, then the world very well could see another formal state military take over the governance, security and overall management of Afghanistan by 2020. If this is China’s move, it will not be a very timid movement to its completion, although it will be multi-phased and strictly circumstance-based. China uses its Side-Principal Rule to get its desired results. The “Side-Principal Rule” dictates avoiding an enemy’s strength and not exposing oneself to any danger. A Chinese government -contracted excavation company is approved to start work in Afghanistan and requires armed security. The Chinese government provides a civilian security group. The excavation company’s security detail comes under attack by the Taliban, because business agreements were made under a government appointed by the Karzai regime. The Chinese government requests that Afghan National Security Forces (ANSF) assist the security group. Two trends develop: ANSF members (likely Taliban-affiliated members) attack the Chinese security group and ANSF conducts illegal taxation of Chinese workers. The Chinese security group is a government funded entity, so the Chinese government works out an agreement stating China will provide military liaisons to the ANSF for oversight and training purposes. The Afghan government will agree in exchange for increased funding. Number of Chinese military liaisons or attaches increase and expand into provincial government positions. The focus to increase Chinese oversight is most prevalent in the provinces that China conducts its business interests, primarily Herat, Bayiman and Badakshan with an increased presence in Kabul and Kandahar. As China’s sphere of influence slowly expands in the three previously mentioned provinces, China creates “anchor facilities or communities” within Afghanistan. China, by this time, will have created infrastructure to support their workers and fulfill the needs of transportation. China will have to either tax or decrease funding for Afghans, in exchange for use of the lines of communication (LOCs) that China created. A large highway, communication and railway system (Super Corridor) will have already begun construction or will be in its approval process in Xinjiang, China leading into Badakshan, Afghanistan. China will slowly and methodically claim “strategic land” (example: pushing the border over a mountain ridge or inward to claim a lowland mountain pass) in Badakshan. Small conflicts between Afghans and Chinese security forces occur, due to illegal land claims, taxation, defunding, non-state actors and TCOs losing their accessibility to a market used for their own funding. China increases its numbers to security forces and the type or amount of assets into theater. The introduction of fixed-wing and rotary-wing assets will enable China to patrol LOCs and approaches to China’s “anchor communities”, contested lands and interests within Afghanistan, with little threat to platforms. Calls for China to withdraw or reduce its activity are almost non-existent, due to China being on the United Nation’s Security Council (with veto power), their newly established economic ties to other powerful countries and the International Community’s perception that Afghanistan has not shown that it can govern and secure its own people without high levels of corruption. Added leverage will come from China expressing that it attempted to bring commerce, stability and humanitarian aid to Afghanistan. China creates significant oversight and influence over Afghanistan. Among China’s goals in Afghanistan is their desire to reopen the Silk Road. This would consist of creating a route from China to the ports in the Indian Ocean. The trade route would have to either go through Highway 1 (east-to-west road) of Afghanistan into Iran or through the Karakoram Highway of Pakistan-controlled Kashmir into Islamabad through to Karachi, Pakistan. The projection made by China has very serious implications on territorial issues for India. Bilaterally (China-Pak) converting Pakistan-owned Kashmir into a part of Northern Pakistan, addresses the 1963 China-Pak agreement according to which Pakistan ceded approximately 5,400 sq. kms of Pakistan-owned Kashmir to China, through which the China-Pakistan Karakoram Highway runs. Both of these scenarios come with an uncertainty about what the security situation might be. Additionally, will China be able to maintain it? While concerned about the impact of Islamic extremism on its Xinjiang Province, it appears to have got Pakistan to persuade its Afghan allies in the Taliban and in Gulbuddin Hekmatyar’s Hizb e-Islami not to attack Chinese Nationals or interests in Afghanistan. If the “risk to reward” ratio is too great, China might abandon this venture all together. Yet, with all of the efforts that have been made thus far, China will likely continue forward with its future partnerships with Pakistan and Afghanistan, even though it will likely become a turbulent one. Specifically, if China continually ignores India’s sovereignty, it could potentially set all of its plans on hiatus. China has not agreed to exchange maps of the western and eastern sectors, the most strategic sections… Evidence exists with the Indian side that China is encroaching upon more Indian land surreptitiously, especially in the western sector. As India increases its work with its allies to combat global terrorism and developing stronger relationships with nations that have strong armies and diplomatic ties, this will make China more cautious in its global strategy of expansion. Europe is a landscape; East Asia a seascape. Therein lays a crucial difference between the 20th and 21st centuries. …over the span of the decades, the demographic and economic axis of the Earth has shifted measurably to the opposite end of Eurasia, where the spaces between major population centers are overwhelming maritime. In the South China Sea, China has become the aggressor against nine other states, as it attempts to gain control of the South China Sea, even reaching as far 200 nautical miles off of sovereign coasts, which is easily within the exclusive economic zones (EEZs) designated by the United Nations. The “nine-dash line” is an outline of China’s South China Sea claims, which encompasses about 90 percent of the 3.5 million square km area. This vague boundary was first officially published on a map by China’s Nationalist government in 1947 and has been included in subsequent maps issued under Communist rule. China’s claims are based off of a mix of historic rights and legal claims, while remaining deliberately ambiguous about the meaning of the “nine-dashed line” around the sea that is drawn on Chinese maps. …China claims that it supports freedom of navigation, its insistence that foreign militaries seek advance permission to sail in its two-hundred-mile EEZ. Although, this conflict is more relevant to the Marine Corps and Navy, the U.S. Army should still maintain awareness of the possibility of the conflict making landfall. China is assessed to have two South China Sea goals: Controlling the Pratas, Paracel, Spratly Islands and Scarborough Reef. Gain access or control of the Malacca, Sunda, Lombok and Makassar straits. These straits see half of the world’s annual merchant fleet tonnage…and a third of all maritime traffic. The oil transported through the Strait of Malacca…is more than six times the amount that passes through the Suez Canal and 17 times the amount that transits the Panama Canal. If a naval battle occurs for control the islands, it can shortly be followed by occupying the islands and then total control of the straits. The possibility of a clash between the United States and China is highly likely if one overreacts while China protects its EEZ claims and United States conducts military activities within close proximity to those EEZ claims. The United States holds that nothing in the United Nations Convention on the Law of the Sea (UNCLOS) or state practice negates the right of military forces of all nations to conduct military activities in EEZs without coastal state notice or consent. China insists that reconnaissance activities undertaken without prior notification and without permission of the costal state violates Chinese domestic law and international law. China routinely intercepts U.S. reconnaissance flights conducted in its EEZ and periodically does so in aggressive ways that increase the risk of an accident similar to the April 2001 collision of a U.S. EP-3 reconnaissance plane and a Chinese F-8 fighter jet near Hainan Island. The large growth of Chinese submarines has also increased the danger of an incident, such as when a Chinese submarine collided with a U.S. destroyer’s towed sonar array in June 2009. Rising U.S.–China mistrust and intensifying bilateral strategic competition would likely make managing such a crisis more difficult. The United States’ awareness of China’s interest in owning the South China Sea routes has been further increased by the military buildup made by China. Beijing is the only capital of the world, ready to use force in the struggle for the sake of expansion. China has not only developed the industry, but also outfitted its area of interest with military equipment. China has placed 38 new diesel and nuclear submarines in the region, purchased four destroyers from Russia and built another dozen on its own, and has launched a network of ground-based ballistic missiles to destroy naval targets. Only one other country has done this before: the Soviet Union during the Cold War. It is no wonder that the Americans are very concerned with the regular quarrels between China and its allies. The proximity to the Malacca Strait poses a threat to the smooth supply of Washington’s main allies in the region—Japan, South Korea and Taiwan. China’s continuing efforts to expand can only be followed by its neighbors also conducting such a military buildup and posturing. This is apparent in the U.S. military’s enhancement of Australian defense cooperation. Unless somehow the ten members in dispute in the South China Sea come to concrete borders and zones, in the future we just might see a purer form of conflict, limited to the naval realm. “China extending Tibet Rail link to Sikkim,” Zeenews Bureau (Feb 14, 2011): 1. Rahul Bhonsle, “Indian Bhutan China Strategic Circle,” (July 16, 2012): 2. Kashav Prasad Bhattarai “China, Bhutan, Nepal and India: Strategic Reflections on Quadrilateral Relations,” (August 22, 2012): 3. Bhaskar Roy, “China declares open season on India?”Indian Review of Global Affairs (09 September, 2010): 1. Sanjeev Miglani, “China steps up Afghan role as Western pullout nears,” Reuters (June 3, 2012): 1. Bhaskar Roy, “China declares open season on India?”Indian Review of Global Affairs (09 September, 2010): 2. G. Parthasarathy, “China leaves footprint on alien Afghan soil” The Pioneer (17 Aug, 2012): 1. Bhaskar Roy, “China declares open season on India?”Indian Review of Global Affairs (09 September, 2010): 3. Robert Kaplan “The South China Sea is the Future of Conflict” Foreign Policy (Sept/ Oct 2011): 1. Bonnie S. Glaser “Armed Clash in the South China Sea (Contingency Planning Memorandum No. 14),”Council on Foreign Relations Press (April 2012): 1. David Lague, “Analysis: China’s nine-dashed line in South China Sea” Reuters (May 25, 2012): 2. Robert Kaplan “The South China Sea is the Future of Conflict” Foreign Policy (Sept/ Oct 2011): 2. Robert Kaplan “The South China Sea is the Future of Conflict” Foreign Policy (Sept/ Oct 2011): 5. Ilona Raskolnikova “China has territorial claims to nearly 20 countries” Pravda (July 17, 2012): 2. Robert Kaplan “The South China Sea is the Future of Conflict” Foreign Policy (Sept/ Oct 2011): 9.
of this series covered conflicts in Asia that the U.S. military must consider as it turns its focus toward the future. Part Two will investigate two conflicts in the Middle East. Many conflicts are started based on beliefs or goals, whether aggravated by Saudi Arabia choosing the United States to defend Kuwait or anti-colonial motivations further driven by Islamist ideology. One reoccurring conflict is Iran. Nuclear proliferation, computer hacking, supplying its many allies throughout the world, is just some of the dimensions of Iran’s mission. The1979 Iranian Revolution started like many revolutions: corruption, contention over a Western-backed regime, divisiveness over economic shortcomings and perceived social injustice. Much of the opposition centered around the conflict between the Shah Mohammad Reza Pahlavi and Ayatollah Ruhollah Khomeini, reforms targeted at religious affairs, relations between Iran and Israel, the re-arrest and 15 year exile of the Ayatollah. In the present day, the new Supreme Leader Ayatollah Ali Khamenei and President Ahmadinejad, have projected Iran back out into global conflict with western powers. Iran has its hand in many of the conflicts that involve the United States and Israel today. The question should be raised: Why? Is an all out dispute with the West the wish of the entirety of the Iranian people or some underlying, more fanatical motivation? The Mohammedan-style of governance can generally be conducted in two ways: By bringing Islamist motivations with certain political limitations, sparing their respective country from international repercussions or be driven by a fanatical belief that cares little for the remnants of humanity. Originally known as the “Anti-Baha’i Society”, the Hojjatieh Society countered the declarations of Baha’i leader Mizra Hussien Ali Nuri, who made claim that he was a prophet named “Bahaullah” and there was no Mahdi “the hidden Imam”. Hojjatieh members believe that true Islamic government must await the return of the hidden imam, or Mahdi, who is currently in occultation. For much the same reasons, the Hojjatieh Society opposed Ayatollah Khomeini’s theory of Islamic government and Vilayat-I Faqih (rule of the supreme jurisconsult). It favors collective leadership of the religious community, and opposes religious involvement in political affairs. The Hojjatieh Society eventually changed their stance on having an Islamic government in Iran, offering the reasoning best given by Iranian President Ahmadinejad’s spiritual mentor, Ayatollah Mesbah Yazdi who said, “It doesn’t matter what the people think. The people are ignorant sheep.”  The goals of Hojjatieh Society are set higher than the means in which they are reached. The importance now lies in an understanding of the goals of the Hojjatieh Society. President Ahmadinejad has made reference to these goals during many of his speeches. The most famous one was during a Sept 17th, 2005 speech to the UN General Assembly, on the subject of “World Peace”. Ahmadinejad later told Ayatollahs in Qom, that he “felt a halo over his head” during his speech. The reality is that President Ahmadinejad and the members of the Hojjatieh Society are asking for the return of the 12th Imam or “Mahdi”. The implication of said return brings much to light. While Christians look for Jesus’ 2nd coming, the Jews await the Messiah and Muslims await the 12th Imam. However, of the three, Allah’s designated Mahdi is the only one who demands a violent path to conquer the world. Though discounted even by the most extremist clerics, a popular belief in Iran holds that the 12the Imam… lives at the bottom of a well in Jamkaran, just outside of Qom (Iran). … His reappearance will usher in a new era of peace, as Islam vanquishes all of its enemies. …But rooted in the Shite ideology of martyrdom and violence, the Hojjatieh sect adds messianic and apocalyptic elements to an already volatile theology. They believe that chaos and bloodshed must precede the return of the 12th Imam. …But unlike the biblical apocalypse…the summoning of the Mahdi through chaos and violence is wholly in the realm of human action. The Iranian leadership belonging to the Hojjatieh Society includes, as aforementioned, Supreme Leader Ayatollah Ali Khamenei and President Ahmadinejad. Additionally, the Iran’s Revolutionary Guard Corps (IRGC) Air Force Commander, Brigadier General Hossien Salami… the architect of Iranian asymmetrical warfare doctrine. General Salami is in lock-step with the current Iranian Supreme Leader Ali Khamenei (who is ultimately responsible for the ascension of Mahmud Ahmadi-nejad to the presidency) and his Chief Advisor, Hassan Abbasi. Hassan Abbasi is the originator of Iranian plans for war with the U.S., the West and Israel. Both are adherents…of the Hojjatieh Society ideology making them hard-core Shi’a Islamic apocalyptics. Does the Iranian leadership have a good base of supporters to see their fanatical ideas brought to light? It can, if you reach the leaders of tomorrow in their educational development. This school of thought is known as the Haghani Seminary in Qom, Iran, headed by Ayatollah Mohammad Tadhi Mesbah Yazdi; President Ahmadinejad’s mentor and spiritual guide. Overall, there are many parts to the equation, yet the published statements made by Hassan Abbasi encompass how these elements are intended on being used. The members of United States military are familiar with fanatical Muhammedean- style rhetoric or grandstanding. An assessment can be made that the Iranian leadership are resolute on following the beliefs of the Hojjatieh Society, yet when assured destruction is imminent, those in power typically lose traction in their drive towards their set endstate. If the endstate is lost, in eastern strategic thinking, a Nation State or Non-State Actor will retreat, revision, recruit, recon, rebalance and reemerge. This process can take one year or a hundred years, depending if element is manned by those lacking opportunity or religious conscription. The elements involved in Iran’s overall strategy are immense. Those who state that Iran is heading in the direction of an all encompassing apocalyptic chaos will not find it in the throes of every conflict with Iran. The human element is not as black and white as Iranian leadership may believe or declare. Iran has enjoyed the many second chances it has been afforded. When Iran’s opposition eventually put their bullets to task, instead of pen to paper, the hardliners of the Hojjatieh Society and its followers will demonstrate how strong or weak their resolve is. What guides a country into conflict is as vital as the strategies used. It can offer those predicting the most likely and most dangerous with the insight of how far the leaders may wish to go and whether the soldiers are willing to go as far. It is important to keep in mind that when hard pressed those fanatics may very easily choose death. On March 26th, 1979 the Egypt – Israel Peace Treaty was signed by Egyptian President Anwar El Sadat and Israeli Prime Minister Menachem Begin. The two countries had been in a state of war since the 1948 Arab- Israeli War and attempted to secure a comprehensible peace. Such a peace included Israel’s withdrawal of civilians and armed forces from the Sinai Peninsula, the northeastern sector of Egypt that connects Africa to Asia. The Sinai Peninsula was captured by Israel in 1967 during the “Six Day War”. As part of the agreement, Egypt would leave the Sinai Peninsula a demilitarized zone. The Egypt- Israel Peace Treaty opened many economic and political partnerships among the United States, Israel and Egypt, to include embassies, utilization of the Suez Canal, oil, and financial aid. Although both leaders received the Nobel Peace Prize for their efforts, the fallout from the treaty was substantial in the Middle East. The Arab League decided to put Egypt’s membership on suspense. As a result, the Palestinians expressed great outrage against the treaty and intrinsic opposition to Egypt’s leadership assassinated the President Anwar Sadat in October 1981. The important aspect of the unrest in Egypt took place in 1924, with the abolition of the Islamic Caliphate when Turkey decided that the Islamic world should seek modernization. After this decision, many hardline Muslims sought a new way to reestablish the Caliphate. One such person was Hassan al-Banna, who in 1928 formed the Muslim Brotherhood. The Muslim Brotherhood has had many struggles with Pro Western opposition (especially in Egypt) and has suffered gravely at times. Like many who are powered by an idea and backed by religious vehemence, the Muslim Brotherhood was patient. In 1981, with the death of Anwar Sadat, Egypt fell under a “state of emergency” for the next 30 years under former Vice President Hosni Mubarak. Over time, what was initially created to suppress the rise of an Islamist movement set on destroying the Pro Western government, would eventually suppress its own people, fueled by the corruption of power. The Arab Spring in Egypt, although it had true beginnings with the death of Khaled Mohamed Saeed (the Internet café patron that was beaten to death by two detectives from the Sidi Gaber Police station), it was swiftly taken over by members of the Muslim Brotherhood. In one of the most methodical returns to power, the Muslim Brotherhood and its members within Egypt’s leadership began their pursuit of reestablishing the Caliphate. One of the many steps by the Muslim Brotherhood to overtake the Egyptian people’s call for freedom occurred during what was supposed to be a speech at Tahrir Square. The speech was to be given by Google marketing executive and leading voice in the Egyptian uprising: Wael Ghonhim. Wael was denied accessibility to the stage by the guards of Sheikh Yusuf al-Qaradawi, the official religious leader of the Muslim Brotherhood and Egyptian President Mohamed Morsi. Yusuf al-Qaradawi was exiled out of Egypt for radical speech and connection to the assassination of former Egyptian President Anwar Sadat and returned shortly after Egypt’s Arab Spring began. This speech at Tahrir Square is considered by many to be the hostile takeover of Egypt’s call for democracy and the beginning of the 3rd Jihad. The 1st Jihad was in 630 A.D. after the conquest of Mecca, Arabia, including much of North Africa, Spain, Persia and West India. The 2nd Jihad was in 1453 A.D. after the capture of Constantinople, which came to expand into South Eastern Europe, Balkans and all but the Southern half of Africa. Upon the inauguration of President Morsi, the Muslim Brotherhood had put an aesthetically pleasing political front to their organization. It should be considered a dangerous act to strictly adhere trust to President Morsi’s words and not to his administration’s works. Where the U.S. military should place great concern is the Sinai Peninsula, especially after the attacks of August 5th, 2012 along the Israel-Egypt border. On that day, Islamist militants attacked and killed 17 Egyptian troops at their Mansoura base in northern Sinai. This act was followed by the militants driving military vehicles towards Israeli soldiers at an outpost, where they were stopped by violent action. What followed on August 8th was President Morsi removing key leaders of the Egyptian military, who were deemed responsible for the losses that day. This move was predicted by many who understand the Muslim Brotherhood and their relations through the years with the Egyptian military. Morsi quite simply seized the moment to appropriate the top military command’s authority for the first time by taking upon himself the firing and hiring of military officers. The President furthermore sacked the head of the Republican Guard, the division responsible for safeguarding the President and members of his regime and replaced him with an officer loyal to the Muslim Brotherhood, Maj. General Hamed Zaky. Morsi’s highhanded actions… are seen in Washington and Jerusalem as the first steps in the Muslim Brotherhood’s takeover of the Egyptian Army. Following the attacks, Egypt, with the permission of the Israeli government, conducted military action to root out the Al-Qaeda linked militants. The campaign was the first time Egypt had conducted an operation in the Sinai Peninsula since the 1973 Arab-Israeli war. The international community, particularly Israel, became concerned when Egypt added tanks and anti-aircraft missiles to the military action without any coordination with Israel. These additions were irregular for fighting against third world Bedouins. This was a clear violation of the 1979 peace treaty and after some added pressure from Israel and its allies, Egypt withdrew from the peninsula. There are reports from Israel that state that Egypt’s army was forced to slow down its counter-terror operations for lack of intelligence on the armed cells’ whereabouts. …every Egyptian and Israeli officer serving anywhere in or near Sinai knows exactly where the gunmen are skulking and their training facilities are located. “The trouble is that Egyptian officers who go past those places look the other way.” …The only action the Morsi Government has taken on the quiet is to place a security buffer strip along the Egyptian- Israeli border off-limits to civilian traffic. …this strip dubbed “The American Highway” of Sinai… It runs from the MFO [Multinational Force and Observers] peacekeepers’ Mediterranean base at Sheikh Zuwied in northern Sinai down to Taba, providing a safe route for the peace keepers, most of them members of the 82nd Airborne Division, between their northern base and their headquarters at Sharm el-Sheikh. ..Egypt no doubt intended this buffer strip to serve additionally for keeping terrorists at a distance from its border with Israel. But IDF (Israeli Defense Forces) observers in that area see very little Egyptian military activity for keeping it sterile and closed to hostile movements. All of these actions can be assessed as steps toward a goal stated by Sheikh al-Qaradawi, as he prayed to Allah. There is a history that needs to be observed as to why this is such an important factor to the Muslim Brotherhood as is relates to Israel. It centers around the Muslim Brotherhood and Hamas. The Muslim Brotherhood’s support for Hamas stems from the ideological affinity between the two movements. Hamas grew out of the Muslim Brotherhood infrastructure in the Gaza Strip, and with the exception of several uniquely-Palestinian themes, its ideology is based on the teachings of Hassan al-Banna, the founder of the Egyptian Muslim Brotherhood. Hamas’ education systems, mosques, preaching, and indoctrination, as well as their immense significance for the movement, are clearly based on the Muslim Brotherhood model. …Hamas seeks to translate the growing political status of Egypt’s Muslim Brotherhood into immediate, substantial gains vis-à-vis the Egyptian authorities to promote its vital interests, such as scaling down Egypt’s security activity against the tunnels to make it easier to smuggle weapons into the Gaza Strip; easing the passage of Palestinians and aid convoys to the Gaza Strip through the Rafah crossing. This is not the only actions that Israel has concern with. Iran has opened an embassy in Egypt for the 1st time in 30 years. President Morsi visited Iran on August 30th, 2012 to attend a summit of the Non-aligned Movement that will boost Iran’s efforts to wriggle out from under international sanctions imposed due to its nuclear weapons program. Additionally in the east, Jordan faces growing instability as Bedouin tribes…are protesting economic conditions and as more than 150,000 refugees have streamed into the country from war-torn Syria. In the north, Lebanese-based Hezbollah leader Hassan Nasarallah said his pro-Iranian militia would launch its rockets and mortars at Israel inflicting “tens of thousands of deaths” if Israel tried to strike Iran. Also, in the north, Syrian opponents of the Assad regime- largely drawn from Syria’s Muslim Brotherhood- may get control of some of Syria’s stores of advanced weapons: rockets, missiles and bio-chemical warfare stores, and they are trying to get American-made Stinger anti-aircraft missiles. The dramatic regional developments are forcing Israeli strategic planners to change their assumptions and force allocations to sources in the Israeli security community. For example, the head of Israel’s Golani Brigade said his forces were now geared more to meeting a jihadi threat from Syria than the traditional threat posed by the regime of Bashar Assad. This ever-present threat upon Israel is not unfamiliar to those of the international community. The speech and propaganda is parallel to those which influenced many of the Muslim Brotherhood’s leaders; the National Socialist German Workers Party. A fact that will haunt those with in the international community is the calls from many world leaders, especially from the United Nations, to have Israel pull back its borders to its pre-1967 lines. These lines would give Jerusalem back to the Palestinians, bring Israel’s eastern border back into an indefensible valley and return Golan Heights back to Syria. Israel gained this ground after a coordinated attack by its neighbors during the “Six Day War”. 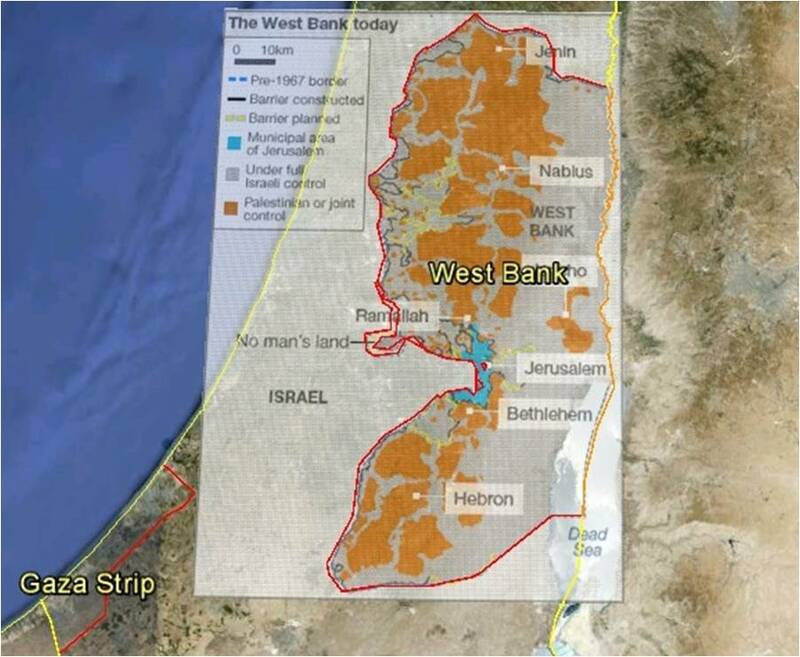 Israel returned the majority of the ground gained back to its previous owners, even at the risk of future abuse. The Israeli people have taken extraordinary measures to ensure peace with the other groups within the state of Israel, to include access for the three major religions to their respective holy places; Church of the Holy Sepulchre, the Temple Mount, the Wailing Wall, Mount Zion, Via Dolorosa, Mount of Olives and Al-Aqsa Mosque. Yet, many in the international community still pressure Israel out of Jerusalem, even going as far as telling the world that they do not recognize Jerusalem as the capital of Israel. This point is further substantiated by the United Nations’ recognition of Palestine as a non-observer status, which is the first step in creating statehood. The next question should be asked, “What would a Palestinian State look like?” When this is answered, much will be revealed and the Muslim Brotherhood with its Palestinian and Syrian allies will be standing at Israel’s door. It should be noted that this conflict has greater meaning and plays a small part of a grander idea. As articulated by Egyptian cleric Safwat Higazi, in where he calls for a trans-national Islamic State. A serious conversation will have to be conducted on where the United States collectively stands on Israel and its right to exist. A strong and final point was made in an article, “Qaradawi and The Treason of the Intellectuals” by Andrew G. Bostom. Bill Samii, “Is the Hojjatieh Society making a comeback?”Radio Free Europe (Sept 17, 2004): 1. Sean Osborne, “Armageddon and the Hojjatieh Sect of Shite Islam” (January 31, 2006): 1. “The 12th Imam….Hojjatieh Sect and Ahmadinejad” (February 10, 2009): 1. Sean Osborne, “Armageddon and the Hojjatieh Sect of Shite Islam” (January 31, 2006): 2. Vali Nasr, The Shi’a Revival (W.W. Norton, 2006), 215. “Qaradawi Says Hitler Was Divine Punishment For Jews” Global Muslim Brotherhood Daily Report. February 3, 2009. “Morsi’s anti-terror ploy to root out pro-US influence in Cairo, cut Israel from Sinai” DEBKAfile. Aug 10, 2012. 1. “Egypt confronts Israel with 6,000 Sinai Islamists as an approved militia” DEBKAfile. Sept. 3, 2012. 1. Meir Amit Intelligence and Terrorism Information Center “A high level delegation of Egypt’s Muslim Brotherhood recently held a first-of-its-kind visit to the Gaza Strip, following up on meetings with top Hamas officials held in Cairo. Both sides consider the improvement of their contacts a means of scoring political gains in Egypt and furthering their status and power.” (November 20, 2011): 5, 7. James Phillips, “Egypt’s Military buildup in Sinai violates its peace treaty with Israel” The Foundry(August 21, 2012): 1. Michael Widlanski, “Egypt setting up anti-aircraft missiles in Sinai” The Algemeiner (August 19, 2012): 3. This entry was posted in Uncategorized and tagged Defense Department, Director of National Intelligence, Director of the Central Intelligence Agency, SECRETARY OF DEFENSE, USA ARMY, WHITE HOUSE PRESS OFFICE. Bookmark the permalink.